Happy Friday everybody! We left Baltimore yesterday and made the short drive to Washington D.C. We're ready to cram in as many tourist-y things as we can in a few short days! I'm so glad to be here on Jennifer's blog today. She is so talented. I love her signature green and nobody decorates with it the way she does. I'm Julia from Cuckoo4Design. I'm a German citizen and a legal alien ;) who lives in a small home on a tight budget in Pennsylvania with my husband, two kids and four cats. I'm known as the crazy German and the crazy cat lady. I wear the crazy badge with pride though. The name of my blog started with my new found love for cuckoo clocks. I hated them growing up in Germany but have come to love them in different colors in my home. 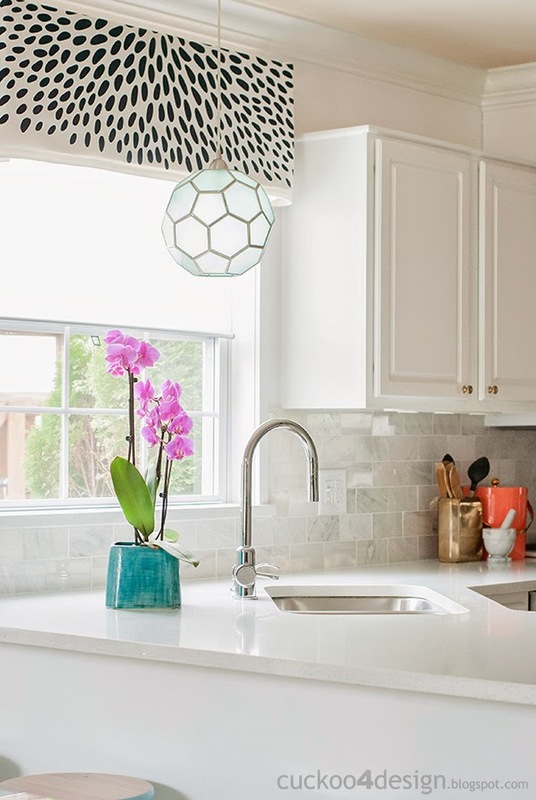 I redid my kitchen and added an new backsplash all while keeping my builder standard cabinets. I made my daughter an upholstered headboard out of Ikea Sanela curtains and individual brass nails. 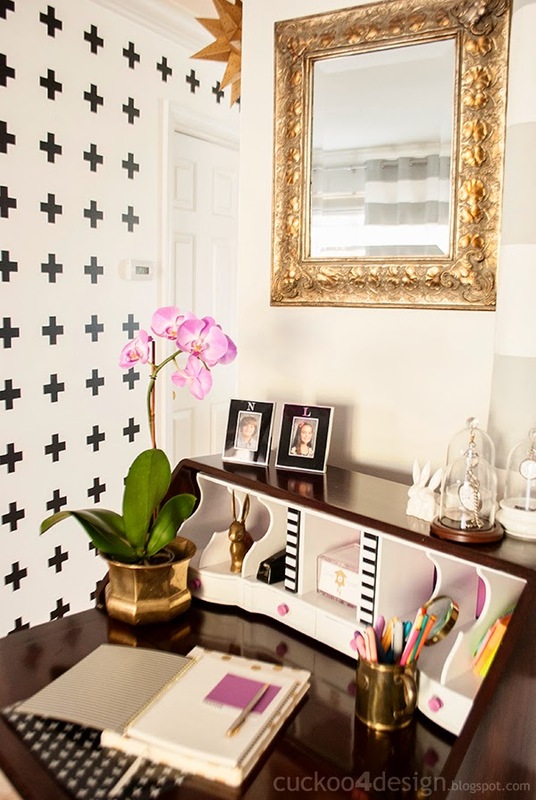 I gave my hallway and desk a makeover with wall vinyl decals that I made with my silhouette and Radiant Orchid, the Pantone color of the year. I reupholstered the button tufted chaise in our bedroom with an ivory microfiber. And I created a gallery wall which includes only one purchased piece of art. The rest was painted by my daughter and me or created with an app. I hope you liked what you saw and come visit me sometimes at Cuckoo4Design. I always love meeting new friends. Oooh, that hallway! I will never tire of seeing it! Now, since we metioned her furry friends, you must see her project that's been pinned 10 million times (not really, but maybe!) - her outdoor cat enclosure. Brilliant for indoor cats who can still have a chance to enjoy the outdoors! 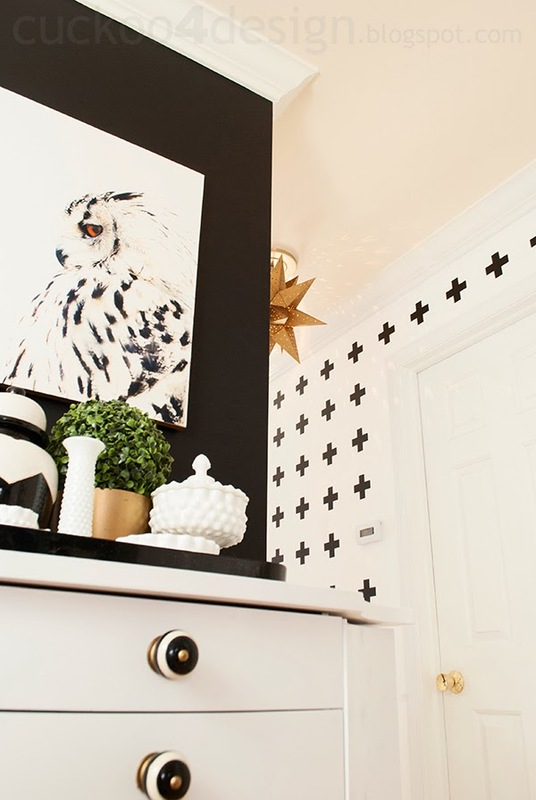 I'm also crazy about this simple box makeover that was inspired by Kate Spade. Alright, that's a wrap for week one of My Favorite 5! But before you get too sad, I have more friends visiting next week! We'll still be hitting the sites in D.C., but I'll be in on a couple of days and have 3 more guest for you to meet. Enjoy your weekend, and I'd love to see you on Instagram! **You can check out all of the posts in this series with each of these links. Happy Reading! 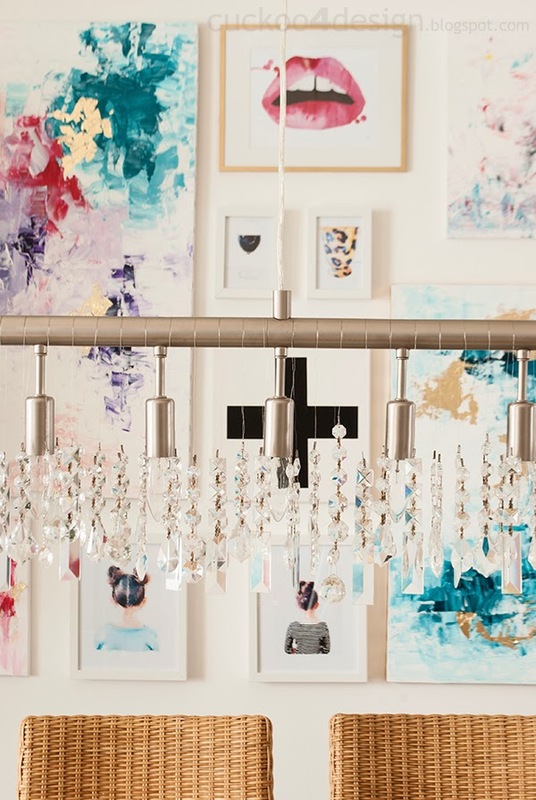 and this is why julia is a domino's favorite diy blogger! she rocks. She really is very talented! What gorgeous projects! Have fun in DC! We took our family last summer and had a wonderful time seeing all the sights! She blows my mind every time! The creativity is unbelievable and Julia is just the sweetest! I've love reading these this week! I love her blog, it is fabulous and I so agree, all of her projects are totally amazing. Thank you so so much for having me today. Your words are making me blush! Fabulous home! Thanks for sharing Julia! you are so talented julia!! 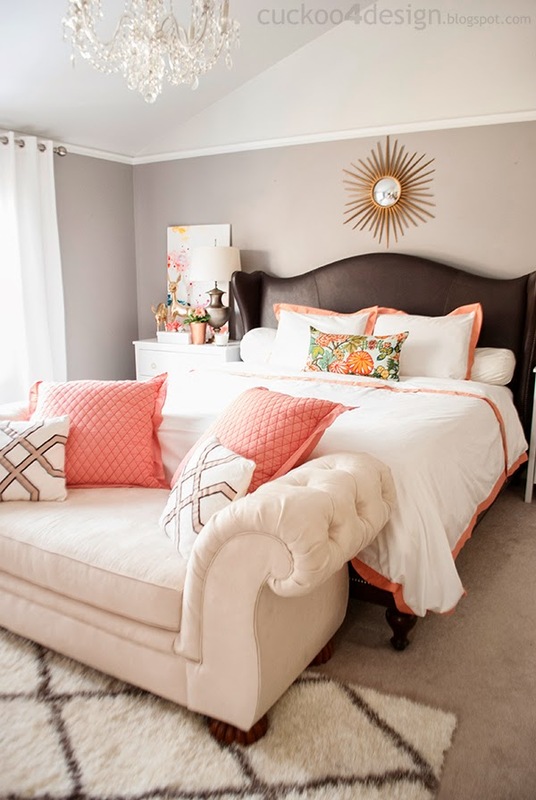 i love that kitchen and the the 'plus sign' wall treatment and the coral in the bedroom and just about everything!!!! wonderful taste and great skillz :) And PS Jennifer - your vignettes on Julia's page are fantastic too! i am crazy over those green lamps!!!! Julia is so talented!!! She is truly a jack of all trades! Love love love Julia! I'm also loving all your awesome IG pics of your travels Jennifer:) what a great way to kick off the summer! Julia is one of my all-time favorites, she's so creative, and always coming up with unique ideas! She truly has the biggest heart for animals! Julia has some amazing ideas! Have a wonderful time!